Submitted photo Explore the world of engineering during Family Day on Saturday, Nov. 17 at the National Museum of the U.S. Air Force. WRIGHT-PATTERSON AIR FORCE BASE — Come and explore the world of engineering as we commemorate the 20th anniversary of perhaps the greatest engineering feat in modern history – the International Space Station (ISS) – during Family Day slated for 9 a.m. to 3 p.m. Saturday, Nov. 17 at the National Museum of the United States Air Force. The first segment of the ISS was launched on Nov. 20, 1998. Designed for children and adults of all ages, Family Day offers a number of interactive opportunities for all to enjoy. Visitors will be able to learn about engineering and spaceflight, living in space and rocketry through a variety of demonstrations and hands-on activities. For example, visitors will be able to launch paper rockets, see model and high power rockets, build a structure with a toy construction kit and see a 3D printer in action. “Storytime” begins at 11:30 a.m. and 1:15 p.m. in the STEM Learning Node in the Presidential Gallery in the fourth building. Preschool and primary-grade children and their families are invited to listen to space-related stories, followed by a hands-on activity. In addition, visitors of all ages are invited to attend special 15-minute long “briefings” that give additional fun facts about the Museum’s extensive collection of Presidential aircraft. These briefings begin at 10:45 a.m., 12:30 p.m., 2 p.m., 2:30 p.m. and 3 p.m. in the STEM Learning Node located in the Presidential Gallery. 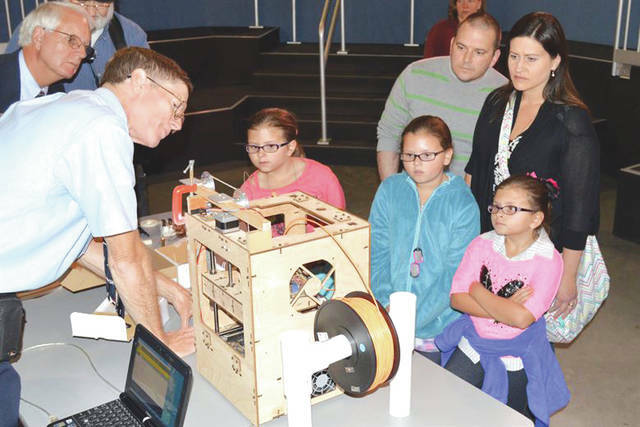 https://www.xeniagazette.com/wp-content/uploads/sites/32/2018/11/web1_141006-F-IO108-022.jpgSubmitted photo Explore the world of engineering during Family Day on Saturday, Nov. 17 at the National Museum of the U.S. Air Force.